Kotohira  (琴平) is a one-horse town known solely as the site of Kompira-san , a large shrine complex. Kotohira is on the JR Dosan Line. From Takamatsu, rapid trains depart hourly between 10AM and 8PM, reaching Kotohira in 49 minutes (¥830). Buses also run from Takamatsu Airport  (50 minutes, ¥1500). The private Kotoden Kotohira Line (琴電琴平線) departs from Takamatsu-Chikko station on the hour and half-past (one hour, ¥610). From Okayama, Kotohira can be reached in one hour by taking the hourly Nanpu limited express (¥3160), or occasional local trains (105 minutes). Another option is the Marine Liner rapid train, which leaves at approx. 44 minutes past the hour, to Sakaide and then a change for the local to Kotohira (80-90 minutes, ¥1300). The shrine entrance is an easily walked few hundred meters south from the train stations. True to its name, the shrine is built on a hill and it's a fairly steep climb all the way to the top. For a taste of medieval luxury, porters can carry you up the hill in a palanquin for even steeper prices (¥6000 and up). The sights below are listed in order as you ascend the steps. From the moment you step off the train, you'll be bombarded by shrieking yellow advertisements for magical Konpira amulets at ¥800 a pop, available throughout the shrine. Kagawa prefecture is famed for its Sanuki udon wheat noodles, and you'll find no shortage of shops hawking them on the road and stairway to the shrine. Kotohira's very own style is less than innovatively composed by pouring soy and bonito flakes on top of your noodles. Konpira Beer is the local microbrew. Most people choose to day-trip from Takamatsu or Okayama, but there are plenty of options in town. 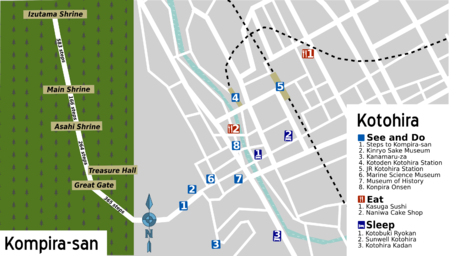 If you don't have any other arrangements (and you're not on a tight budget), head for the cluster of hotels around the Konpira Onsen. This page was last edited on 26 June 2015, at 20:16.